Funfetti Cheesecake Hamantaschen - Kosher In The Kitch! 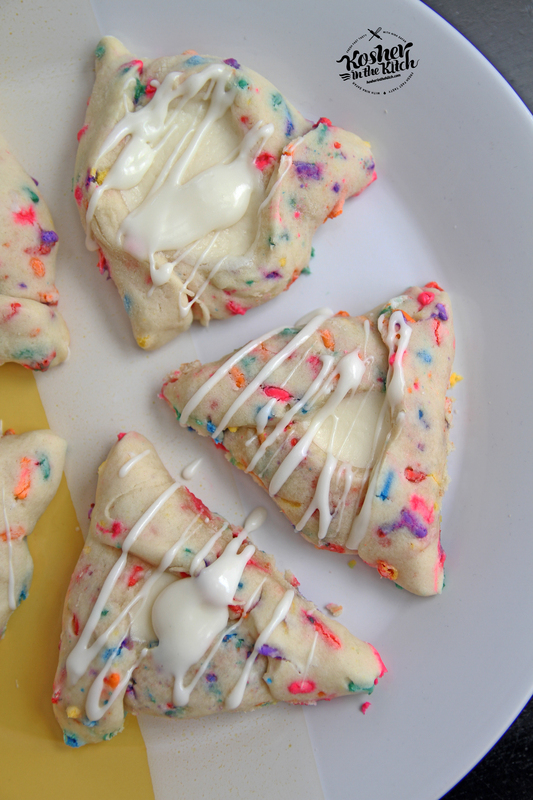 Funfetti Cheesecake Hamantaschen - Kosher In The Kitch! Cream together sugar, oil, eggs and vanilla. Slowly add flour and baking powder. Mix together. The dough might be crumbly, use your hands to smooth it out and combine it. Add sprinkles to dough. (add the sprinkles in slowly, depending on how many sprinkles you want in the dough and don’t over mix them with the dough) Roll out dough on floured surface (about 1/4 to 1/8 thick. Not too thick since then the circles are hard to shape and will open up. Not too thin since then it will rip when shaping or filling) and cut out circles using a large circle cookie cutter or the rim of a large glass cup or mason jar. Fill center of circle with cheesecake filling (about 1/2 tsp to 1 tsp) and bake on 350′ for 12 to 15 minutes depending on how soft or crispy you want them. I like them super soft so took them out around 12 minutes. Once hamantaschen have cooled off drizzle melted white chocolate or cheesecake icing on top. Optional, top with more sprinkles! For cheesecake icing, I took leftover cheesecake filling and added some powdered sugar and milk to get a thinner consistency. Regular icing (powdered sugar and milk or water) would work great as well. This recipe is amazing. Great dough to work with! These look delicious! How long do you reckon they can be stored for (refrigerator or air tight container)? Hi. Can’t wait to try these. Would coconut oil work? What oil do you use? Thanks! These are my son’s FAVORITE hamantaschen! He requests them year round. I use canola oil. These are by far the best hamantashen iv’e made. The dough was really easy. I mixed chocolate chips into the filling. I would reccomend this to everyone! Pingback: 36 Mouthwatering Hamantaschen To Make This Purim - Do You Still Hate Me? Can I make these now and freeze them ahead of time for Purim ? Yes these can be frozen just don’t add any icing until you defrost it and serve. That is best fresh! So happy! Hope you love them! Happy Purim!